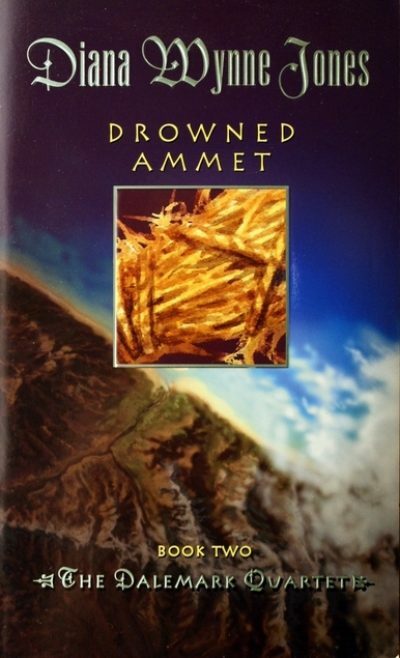 1977’s Drowned Ammet is the second volume in Diana Wynne Jones’ Dalemark Quartet. At first, Alhammit “Mitt” Alhammitson’s childhood is happy enough, even though his family is not in the best of circumstances. They are peasants, living on land belonging to the malevolent Earl Hadd. The earl is far too busy feuding with other earls to even notice a farming couple and their child. Unfortunately, the family does not escape the notice of Hadd’s rent collector. He takes a dislike to them, doubles their rents, and eventually forces them off the land. Mitt’s father joins the Free Holanders, a group of radicals. The group is betrayed to the earl; Mitt’s father disappears and is later said to have been killed by the earl’s soldiers. Mitt’s mother Milda believes that she knows who betrayed her husband and raises Mitt in the belief that he must take vengeance on the remaining Free Holanders: Siriol, Dideo, and Ham. Who but they could have betrayed their comrade? Why else would they have survived the earl’s heavy hand? Mitt’s vengeance is slow and careful. He befriends his father’s former comrades, accepts their mentoring, even works beside them on their fishing boat. His goal: find some way to make them pay. Mitt’s mother remarries, to Hobin the gunsmith. This gives Mitt the opportunity for which he has been searching. He steals small amounts of gunpowder until he has enough to construct a bomb. His cunning plan? Use a religious festival to get close enough to Hadd to blow him to smithereens, allow himself to be caught, and then “reluctantly” admit that Siriol, Dideo, and Ham put him up to it. It would likely bring Mitt little comfort to know being a member of Hadd’s family is as little fun as being one of his subjects. Hadd’s granddaughter Hildy has been promised to a lord she knows not and has never met. Her father Navis never recovered from his wife’s death in childbirth and will do nothing to save his daughter from a strategic marriage. The plan, as the case with so many plans, does not survive contact with reality. The earl’s son Navis kicks the bomb away before it can kill the earl. However, someone else hates the earl (probably an aristocratic enemy): a sniper kills Hadd despite the distraction of the ruckus. His plan having failed, Mitt discovers he doesn’t actually want to be arrested, tortured, and executed. He opts to run away, or rather, to sail away on a stolen boat. Now it just so happens that the boat he commandeers has already been stolen: by Navis’ children and Hadd’s grandchildren. Her father Navis acquiesced in the strategic marriage. Hildy refuses. She and her brother Ynen plot to steal a boat and flee their oppressive family. The would-be assassin and the grandchildren of the man he planned to murder find themselves on a small boat headed into unfamiliar waters…. The happiest protagonist in a Diana Wynne Jones novel is an orphan. Preferably an orphan without siblings. Poor Mitt has a surviving mother. one with the common sense of a newly hatched chick. Odd that Mitt can recognize that and yet believe her implicitly when she states that she knows who betrayed his father. Hildy and Ynen are also not orphans (they have a surviving dad) but their dad is too passive to protect them from their grandfather. At least Hildy and Ynen are generally nice kids … and nice to each other. Another Jones trope is a sibling pair, one nice and one nasty; this pair is an exception. This novel has been released in several editions, some of which have been much longer than others. Some are as long as 300+ pages. The book feels much shorter. The plot moves along at a nice pace, dragging its hapless protagonist towards radicalization and beyond. One sympathizes with the characters, even though some of their decisions are indefensible. We understand why they made those poor decisions. Drowned Ammet is available here (Amazon) and here (Chapters-Indigo). Either my new phone has a wonky browser, or there are several repeated paragraphs. I don't know why that keeps happening. No repeated paragraphs, but the arranged marriage is described twice. Are the different-sized editions differing in content, typesetting, or both?